Wood is a wonder material. It is beautiful, natural, renewable, durable, reusable, flexible, and carbon neutral (when harvested sustainably). Wood is the most useful and most sustainable material. Fuel e.g. firewood and biodiesel. Responsibly sourced, it is renewable. Trees, if cut down, will regrow to provide a wide range of other benefits described below such as carbon storage, oxygen generation and forest habitat. Trees and wood products store carbon. As trees grow, they take carbon out of the atmosphere. When the trees are harvested and used to make products, the carbon remains stored for the life of the product. 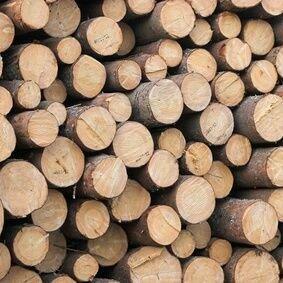 50% of the dry weight of wood is carbon. The production and processing of wood is more energy efficient than most alternatives, giving wooden products a very low carbon footprint. It can usually be used in place of materials like steel, aluminium, concrete or plastics which require large amounts of energy to produce. Forests provide natural services such as flood control, erosion control and habitats for animals and plants. Wood is a durable material for both homes and commercial buildings. When properly looked after it can last hundreds of years. Modern preservatives enhance it’s natural durability. Wood is very strong. A comparison with steel and concrete shows that radiata pine structural timber, for example, has a strength for weight ratio 20 percent higher than structural steel and four to five times better than non-reinforced concrete in compression. Wood itself is a natural insulator due to air pockets within its cellular structure. As an insulator wood is 15 times better than masonry, 400 times better than steel, and 1,770 times better than aluminium. Construction with wood is fast and efficient. Wooden buildings can be built year-round in most climates. Wood is naturally beautiful and aesthetically pleasing. Because woodwork is often done on site or pre-fabricated locally or regionally, choosing wood means supporting local jobs for carpenters and craftspeople.